Doug Engel has quietly designed some of the coolest, most challenging puzzles in the last 10 years. If you're a sequential movement fan - you need to get ALL of his puzzles. Games Magazine had a 6 page article on his puzzles in the December 2007 issue. This puzzle is called Let Em Fly. Getting the colored circles is the first problem, getting the arrows to point up - that's where the real challenge lies. Great time-waster. Click on the red square and move it immediately to the bottom - don't go over the edge. 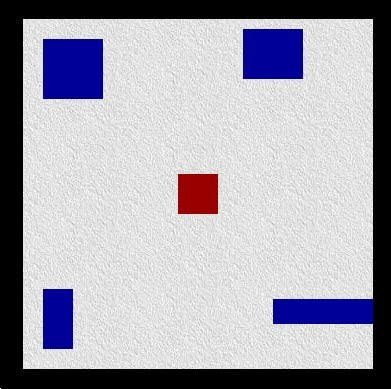 The object is to keep the red square away from the mobile blue rectangles. Note, they speed up! 20 seconds: very good. 30 seconds: wow. 40 seconds: you are a God! 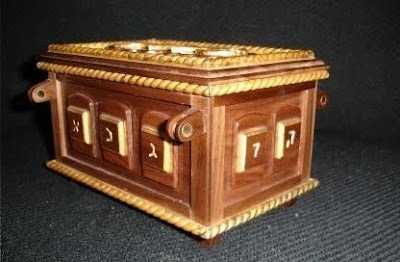 The Ark of the Covenant is a 25 move to open puzzle box. Ark of the Covenant is constructed with Walnut and is 24k gold leafed. Look for the November issue of Games Magazine. There is a 2-page review about the puzzle. 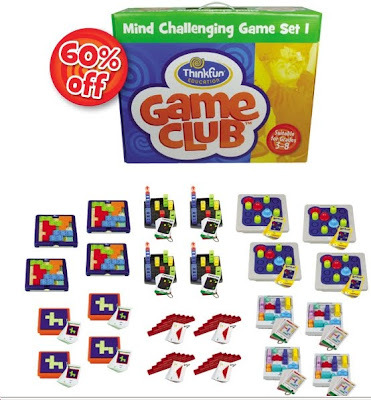 Think Fun has a nice set of puzzles for kids in grades 3-8. Makes a good gift for kids. Buy one for your neighborhood school. Andrew Reeves invented the Isis puzzle a couple of years ago. At the New York International Toy Fair - February 2009 - I had the opportunity to meet Andrew and play with his new Kuku puzzle. This puzzle is a lot of fun and will drive you cuckoo. 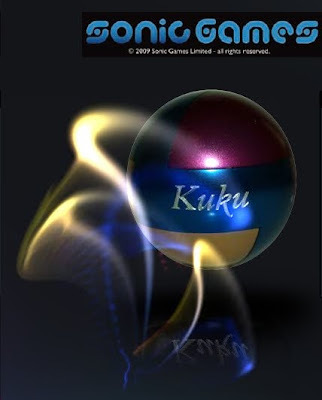 The Kuku puzzle has different levels of complexity. The easiest level is not so easy. The hard & hardest levels are VERY HARD. 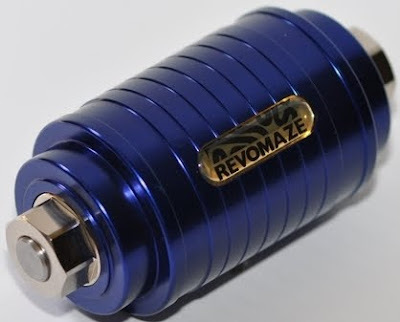 The puzzle is made of brushed aluminum and is just plain fun! Wayne Daniel designed this incredible puzzle. 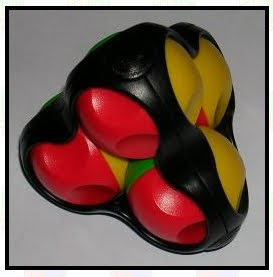 Each of these 5 puzzles rests inside a larger puzzle - like the Russian dolls within dolls. This puzzle was written up in the New York Times. At the 2006 International Puzzle Party in Boston, Wayne Daniel sold me his last copy. Naturally, I had to write about it for Games Magazine. 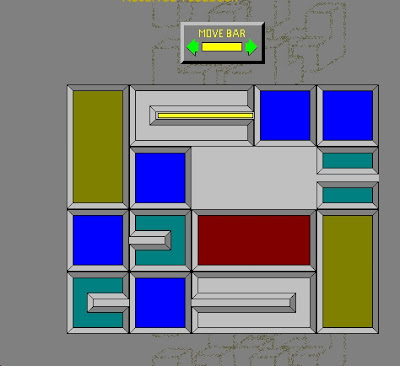 Wayne Daniel also produced a fine animation about the construction of the puzzle. You can buy a copy at www.mrpuzzle.com.au/prod131.htm Brian Young is Mr. Puzzle and is a good puzzler. By the way, if you're interested in joining the Oskar van Deventer fan club, shoot me a note. http://www.puzzleparadise.ca/ John Devost is running a puzzle auction. Great opportunity to add to your collection! The puzzle above was designed by Leonid Mochalov. Seems like only the shopping cart link works. Nevertheless, we are always pleased to see puzzles in the classroom. 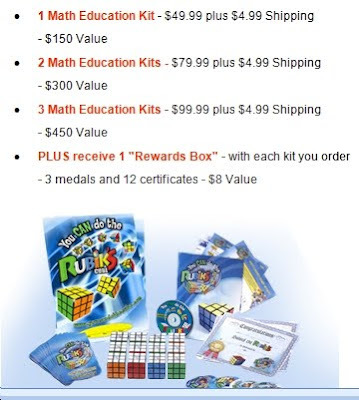 We envision students asking their teachers: when are we ever going to need to solve Rubik's Cube? Teacher response: say you're at a party and a good looking female has brought her cube....you can teach her! This Mechanical Puzzle correspondent had the good fortune of spending an afternoon with the inventor of Zoki, Zoran Pavlovic. 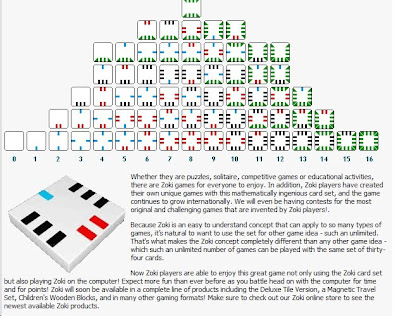 Zoki can be played as a puzzle or as a competitive game. Zoran Pavlovic created 2 other edgematching games, but they seem to be no longer available. 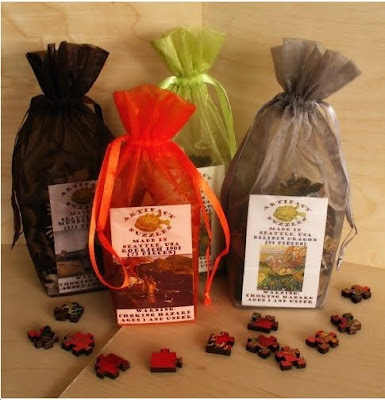 www.artifactpuzzles.com Laser cut jigsaw puzzles. They're having a 25% discount sale! This Mechanical Puzzle Correspondent has not had the opportunity to play-test these jigsaw puzzles. So if you have, please contact us! 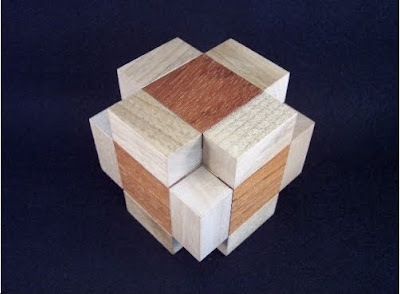 Mike Henkes created this terrific online puzzle. 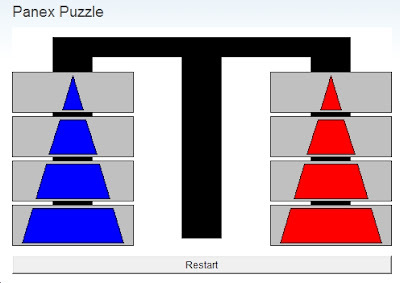 The 2 rectangular white pieces are fixed and cannot be slid. You must transfer the yellow bar from the top to the bottom. Difficult and fun.